Endometriosis is defined as the presence of a functioning endometrium outside the uterus. , It is a common gynecological condition that affects up to 22% of all women, 8-15% of women of reproductive age and 6% of premenopausal women. , Most of the reported cases occurred in gynecologically induced abdominal or pelvic scars, including hysterectomy, episiotomy, caesarean section and laparoscopy. ,,,, It is extremely rare in a surgical scar, appearing in 0.1% of women who have undergone caesarean section. Its clinical diagnosis is confused with suture granuloma, hematoma, abscess, sarcoma, desmoid tumor and metastatic malignancy. ,,, We report a case of scar endometriosis in a woman who underwent caesarean. A 27-year-old (G 1 P 1 ) female presented with mass of 2 years' duration near a previous caesarean section scar that was gradually increasing in size. It was associated with cyclic pain during menstruation in the swelling and polymenorrhea. On examination, the nodule was 3 cm × 3 cm, well defined, firm, brown to black in color, tender on palpation and non-reducible. Ultrasound abdomen showed a nodule that was well defined and anechoic, and there was no other significant contributory finding. The clinical differential diagnosis was suture granuloma, hematoma, melanoma and desmoid tumor. 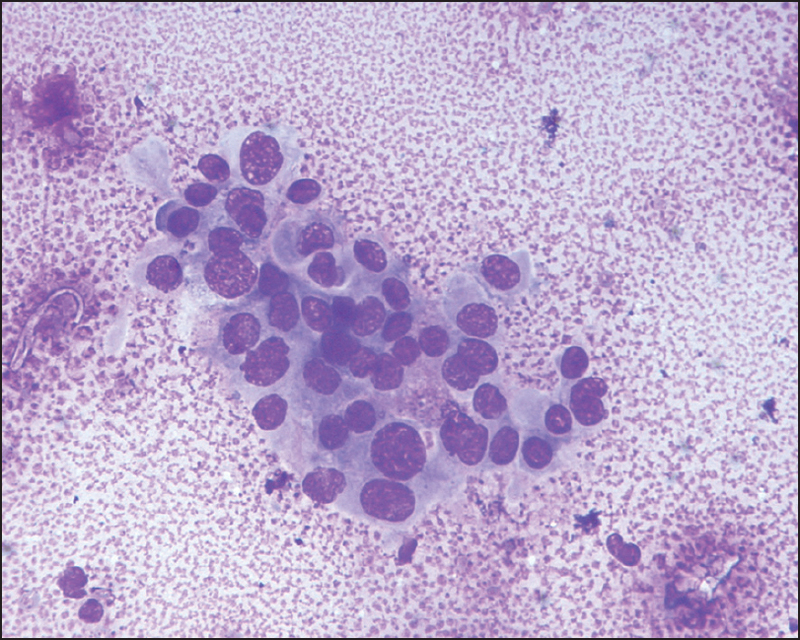 The patient was then referred for fine needle aspiration cytology (FNAC). FNAC from the abdominal lump was carried out. Some smears were air dried and stained with Giemsa stain and some smears were fixed in 95% ethanol and stained with hematoxylin and eosin stain. The smears were cellular, consisting of epithelial and stromal fragments. The epithelial cell was arranged in monolayer sheets of polygonal cells with large, hyperchromatic nuclei and moderate amount of cytoplasm, with considerable nuclear overlapping. The stromal aggregates also showed crowded overlapping nuclei and scant admixed hemosiderin-laden macrophages; mild to moderate epithelial atypia was observed in this case [Figure 1] and [Figure 2]. 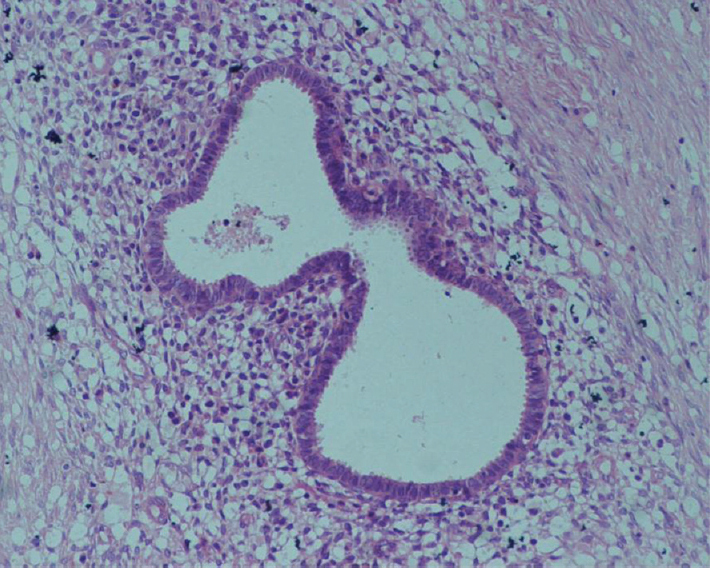 Subsequent biopsy material revealed the characteristic histologic pattern of endometriosis [Figure 3]. Per-operatively, there was no evidence of endometriosis anywhere else. The patient was asymptomatic after 6 months of follow-up. Scar endometriosis is a rare condition that affects women of reproductive age because of typical clinical history and clear-cut cytomorphological features. Cytodiagnosis of scar endometriosis was rendered without any difficulty in this patient. Thus, FNAC is an inexpensive, rapid and reliable method to conclude the diagnosis before surgery. Khaled A, Hammami H, Fazaa B, Zermani R, Ben Jilani S, Kamoun MR. Primary umbilical endometriosis:A rare variant of extragenitalendrometriosis. Pathologica 2008;100:473-5. Agarwal A, Fond YF. Cutaneous endometriosis. Singapore Med J 2008;49:704-9. Pathan SK, Kapila K, Haji BE, Mallik MK, Al-Ansary TA, George SS, et al. Cytomorphological spectrum in scar endometirosis: A study of eight cases. Cytopathology 2005;16:94-9. Medeiros Fd, Cavalcante DI, Medeiros MA, Eleutério J Jr. Fine needle aspiration cytology of scar endometriosis: Study of seven cases and literature review. 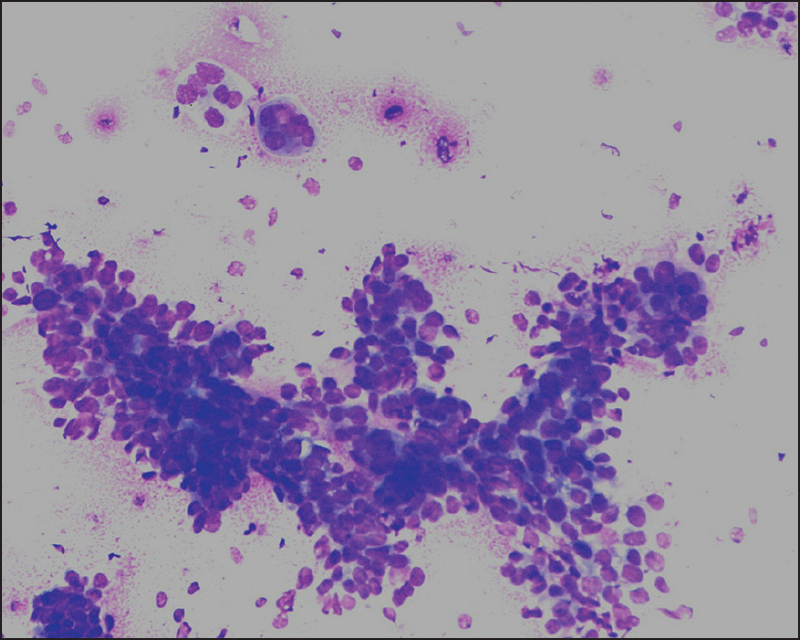 Diagn Cytopathol 2011;39:18-21. Agarwal N, Subramanian A. Endometriosis -morphology, clinical presentations and molecular pathology. J Lab Physicians 2010;2:1-9. Goel P, Sood SS, Dalal A, Romilla. Caesarean scar endometriosis-report of two cases. Indian J Med Sci 2005;59:495-8. Gajjar KB, Mahendru AA, Khaled MA. Ceasarean scar endometriosis presentating as an acute abdomen: A case report of review and literature. Arch Gynecol Obset 2008;277:167-9. Blanco RG, Parthivel VS, Shah AK, Gumbs MA, Schien M, Grest PH. Abdominal wall endometriomas. Am J Surg 2003;185:596-8. Horton JD, Dezee KJ, Ahnfeldt EP, Wagner M. Abdominal wall endometriosis: A surgeon's perspective and review of 445 cases. Am J Surg 2008;196:207-12.